Let’s discuss the weaknesses of “The Wynkahthu Job” first. There are two pretty important dramatic points that this episode brings up, just to abandon them. The first is the issue over Ezra being so smitten by Hondo. Hera rightly calls this out. Hondo is fun to watch, but he is definitely too dangerous to trust, so making Zeb the leader of this mission over Ezra was the right idea. Hera and Kanan discuss this, in which Kanan says that Ezra needs to learn this on his own. Which–no. Not in the middle of a rebellion where life and death, success and failure is constantly at stake. Ezra does exhibit some moments where he starts to lose his admiration for Hondo (with his casual acceptance of supposedly dead/missing partners), but Ezra never seems to come to the full realization of Hondo’s dishonesty (despite multiple examples). 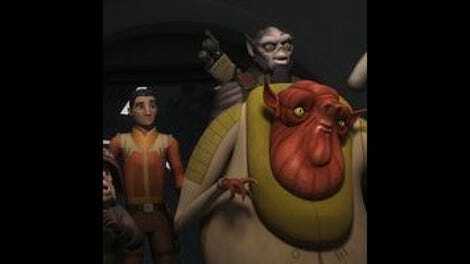 The second point concerns Ezra’s sulking and snide remarks towards Zeb as a leader. He’s brooding, moody, and snarky, but his impatience once again puts him in trouble–cutting that hole in the door–and he’s never given the proper dressing down for it. Moreover, Zeb is shown to be a remarkably good leader. His screw-ups only occur due to information that’s never provided to him. Ezra (and the episode, really) never gives Zeb credit though, which is disappointing in a lot of ways, mainly because of how underutilized he’s been this season. Both of those above points suggest that Ezra’s unlikeability this season is less a failing on the narrative level and more a wonky attempt at a long story arc or theme (I’ll get into this a bit more in the Stray Observations). As for the episode itself, “The Wynkahthu Job” succeeds primarily because Gary Whitta’s script is focused on maintaining some solid pacing and solid action. Oh, and ample amounts of Hondo. Jim Cummings gives the crafty, yet pathetic, space pirate the perfect off-beat, comical edge that’s always welcome on this show. I was less enamored by pairing him with Azmorigan, who hasn’t been seen since season one’s “Idiot’s Array” and who is… just gross, morally and physically. James Hong is fine, but his character doesn’t register with the same naughty appeal as Hondo–and also, Hera lets him off the hook way too easily. Although it’s for a reason: the rebellion’s desperation for any good supplies forces the team to take this job. And this job involves leaping on onto a ship that’s gradually being swallowed up by a storm, in order to grab the proton bombs on board. Whitta penned this season’s other strong episode, and they both primarily let its characters be characters, all in the context of rough-and-tumble action that rarely ceases. Whitta seems to understand the importance of staging smart, adventurous sequences, which at this point is Star Wars Rebels’ biggest strength. He also remembers to emphasize the rebellion’s shortcomings and lack of assets. Hondo’s line reading on the words, “We… are… des-per-ATE!” is hilarious, but also a direct reminder of how dire the shape the rebellion is in right now. (The follow-up details, in which Hera describes how the Empire wouldn’t think twice about letting that ship go, adds to their sad verisimilitude.) Whitta’s script is also propped up by Mel Zwyer’s direction. I love when the show does Dead Space-esque trekking inside abandoned, terrifying ships. Even if the tension is undercut by the discovery of Hondo’s deserted “partner” Melch and his subsequent real story, Zwyer maintains the claustrophobic darkness of those hallways and corridors–you get the sense that even during this long bit of exposition, something still lurks behind the corners. I do hope that Star Wars Rebels puts together at least one script that is full-on horror, or at least something that can be portrayed in a thrilling, scary fashion. There are some more nit-picky aspects to the episode that serve more of a distraction than anything. Bringing in AP-5 to explain the ship (and then to…not explain its defenses) feels like Whitta needed someone to exposit when it would have been stronger to have Zeb, Chopper, Ezra, Hondo, and Azmorigan discover those defense droids on their own. Also, it’s odd that Azmorigan could easily destroy one of those droids with panicked shooting, but they all struggled against the remaining four, particularly with Zeb and a freaking Jedi on the team. I do buy it though, in the sense that they were taken by surprise, that they still were trying to gather (and protect) those bombs, and, more importantly, that it made for a crazy, exciting action sequence to watch. That swinging portrayed in the screenshot in the heading was, admittedly, cool as hell, as well as watching the ship getting wrecked in the storm below (this show knows how to crash some ships). 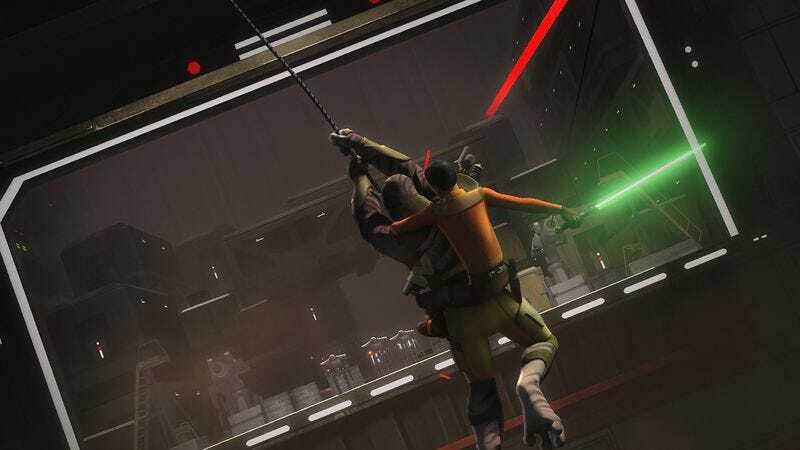 Star Wars Rebels still struggles to push its characters in meaningful directions, but sometimes they make up for it with something fun and exciting. At this point I guess that’s all we can ask for. Does anyone remember the 2003 version of Teenage Mutant Ninja Turtles? It was pretty good, but the fourth season was bold in that it spent that entire season making Leo am angry, moody, aggressive jerk. A lot of fans hated it, but I thought it was daring to take a mostly middling character and push him through a dark period, especially in relation to a growing number of threats around them. Leo grew darker as the stakes grew darker, but also ending up annoying and hurting everyone around him. I bring that up because I think that’s what they’re trying to do with Ezra this season. He’s older and he’s going through (what adult writers assume is) typical teenage moodiness, in addition to typical Dark Side influences and past failings. The problem here is that it’s portrayed inconsistently and there’s no real sense in how it’s affecting the team (or the rebellion) at large. He’s just frustrating on screen, and with no concrete response to his attitude from anyone else on the team, he just comes off annoying for the sake of it. Building off that, I think Kanan’s blindness is also thematic, in that he cannot “see” Ezra’s real self at the moment. He keeps downplaying Ezra’s behavior, actions, and attitude, not recognizing how much of a problem the young Jedi is truly being. This is also 100% a theory, so take it with a grain of salt. As for the episode itself? I love the reveal that Melch was hiding in the only treasure chest that Hondo saved. But that raises the question: what was the real treasure that Hondo was looking for?